It’s springtime and time for new product lines… Our friends over at Detours sent me a couple new bags to review and I will be putting them to the test over the coming fine weather months. I’ve already had the opportunity to take the new Ballard Market Pannier on a very bumpy maiden voyage commute last Friday am sharing my first impressions. Still to come will be my first impressions and review of the waterproof Coffee Bag which is designed to keep some smaller items dry and secure. Seattleites flock to the Ballard neighborhood every Sunday for one of the best farmers market in the Northwest. If you’re rolling up on a bike, this is the perfect pannier to take with you. 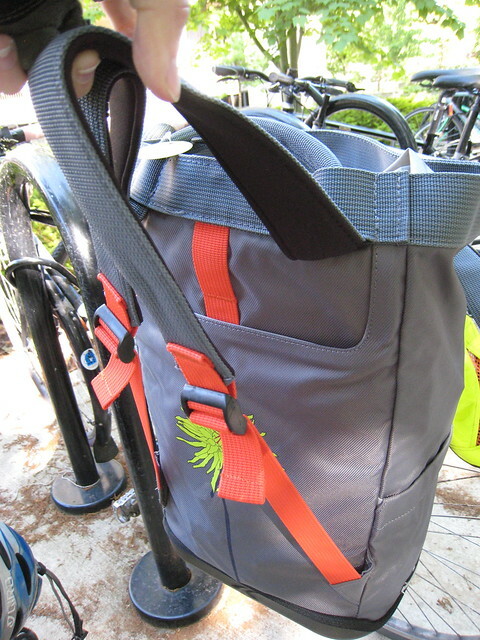 An easily hide-able padded shoulder harness lets you wear the pannier as a backpack when browsing the stalls, and two simple yet sturdy pannier clips attach to your bike rack for the ride home. A lightweight waterproof base keeps your bag dry from street spray, and a removable raincover protects your goods when the skies open up. Interior organization and a laptop sleeve makes this a great option for a casual office commuting as well! Distinctive prints make this bag just as beautiful as the fresh produce you’ll haul home. Available in Black, Red or our exclusive Herman Yu Dahlia print. 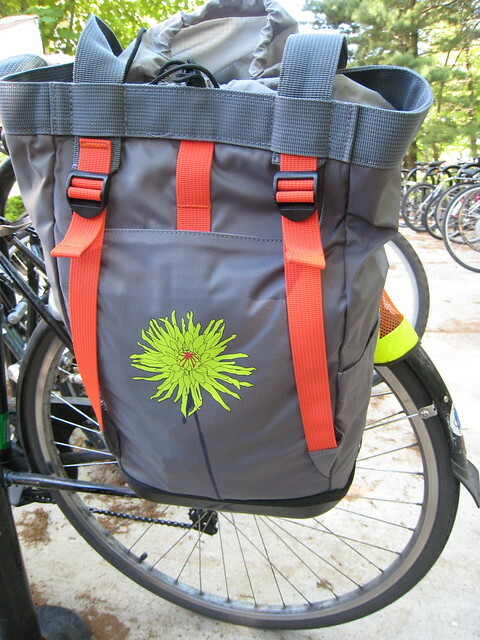 I rode with this Ballard Market Pannier on a long commute last Friday. 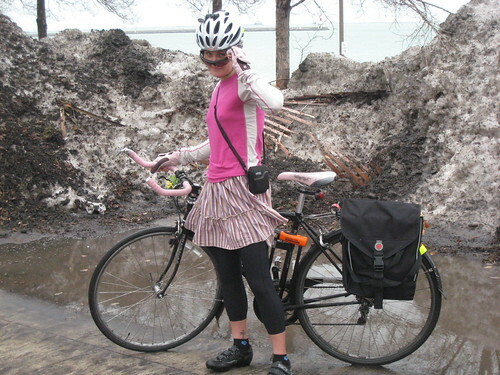 It fit more than everything I needed for work and for my bike, and it felt so much less clunky than the Banjo Brothers Market Pannier that I’ve been using (that RL also reviewed a while back). Part of it could be that it’s because I finally packed only what I really need. My bags tend to accumulate “baggage” over time and I end up with quite a hefty load after a while. 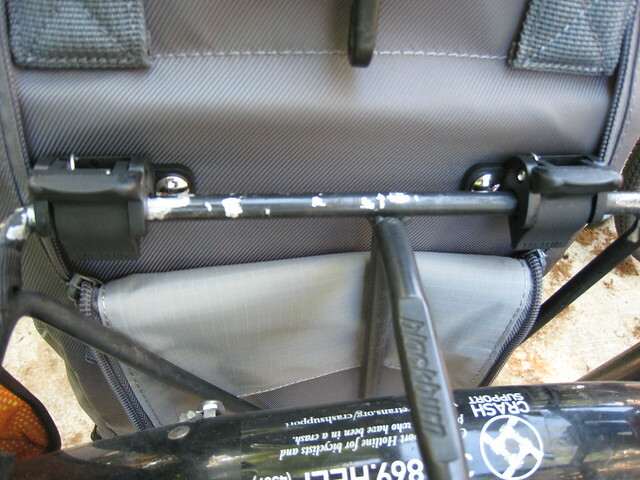 My commute followed a lot of bumpy roads and the pannier remained securely in place on my Blackburn rear bike rack. If I ever chose, I could also wear this bag as a backpack via nicely padded straps that easily pull out to make backpack straps. 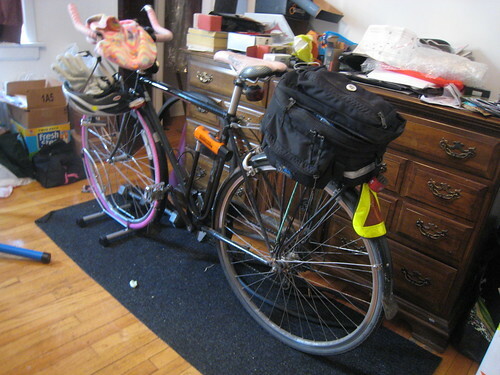 No more need to decide between a backpack or a pannier! Being chic on a bike goes a long way towards making this my new “go to” bag. Stay tuned for the full review after I’ve put in a few more commutes with this bag. Once again – still… – I’ve been dealing with illness — and resulting time off the bike (and off of work). Not too long ago, I posted about being too sick to bike. Then – with a sudden burst of energy and need to be active – I did return to my bike for a mere few days before landing myself in bed for another week of being sick. I’m happy to report that so far this week I’ve been riding again, but I’ve decided to “go lite” and have changed my cargo set-up. I’m just carrying my seasoned (err – old) trunk bag instead of a pannier that’s just too easy to fill up with stuff and weigh me down. 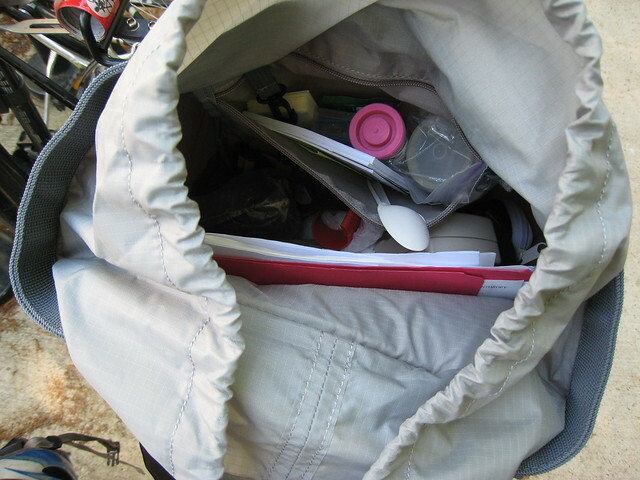 Several years ago, I also stopped using backpacks due to neck and shoulder pain. Unfortunately it’s also limited my side-trips on the way home to grab groceries, since I’ve left no room for extras. At this time, I think that’s just as well.. since the last time I reported that I was back on my bike I did end up sick again. No need to overdo it. Traveling lighter has been a refreshing way to go. I’m considering it a “spring cleaning” of sorts. No extra baggage. 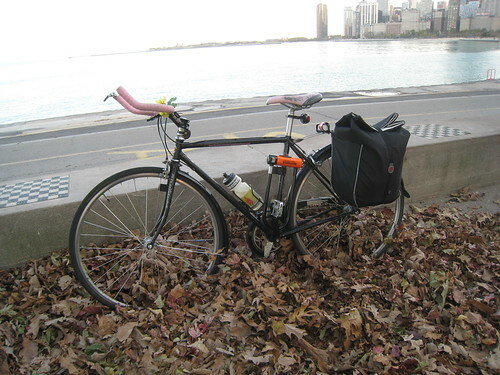 What’s your preferred method of carrying your stuff while biking?